Some of you may not know that a number of us go way back together to the days when we were members of the Guppies, unpublished and struggling to get published. I'll date us by saying it was back in the age before self-publishing. So when I saw this adorable cover and clever title, I was thrilled to see my friend Peggy Ehrhart was the author. Please join us in welcoming Peggy! And don't miss her giveaway of a copy of MURDER, SHE KNIT! My sleuth, Pamela Paterson, usually bakes her goodies from scratch, especially when the Arborville knitting club, Knit and Nibble, is meeting at her house and it’s her job to supply the nibbles. But sometimes a person gets busy and needs to come up with a sweet treat fast. Here’s a version of the classic thumbprint cookie that uses readymade sugar-cookie dough from the supermarket refrigerator case. I call them “fingerprint cookies” because the dough is very soft and a thumbprint-sized depression will make your jam sink all the way through to the cookie sheet. You’ll need a roll of readymade sugar-cookie dough and a small amount of good jam—whatever kind you like, also optional powdered sugar. A 16.5 oz. roll of dough will make 32 of these cookies. Cut your roll of dough in half lengthwise. Slice each half into 16 slices. If you don’t want 32 cookies all at once, you can freeze half the dough to use later. Roll each slice into a ball. Use the tip of your index finger to make a shallow hole in each ball. Put a tiny scoop of jam—less than ¼ teaspoon—in each hole. Arrange the filled dough balls on cookie sheets, leaving lots of space between them. The balls will flatten as the cookies bake and if they start out too close together, you’ll end up with one giant cookie. To bake 16 cookies I used two 15” x 10” cookie sheets and put only 8 dough balls on each. Bake the cookies at 350 degrees for about 14 minutes, but check on them after 12 minutes. When they’re done they won’t look very brown but they’ll continue to bake a bit on the hot cookie sheets after you take them out of the oven. Loosen them with a spatula while they’re still warm. They become quite crisp when they cool and can break if you loosen them then. Here is one sheet of baked cookies. You can sprinkle powdered sugar on the cookies for a special touch. Put a spoonful of the sugar in a small sieve and shake it over the cookies while they’re still warm. Arrange the cookies on a pretty plate to serve. 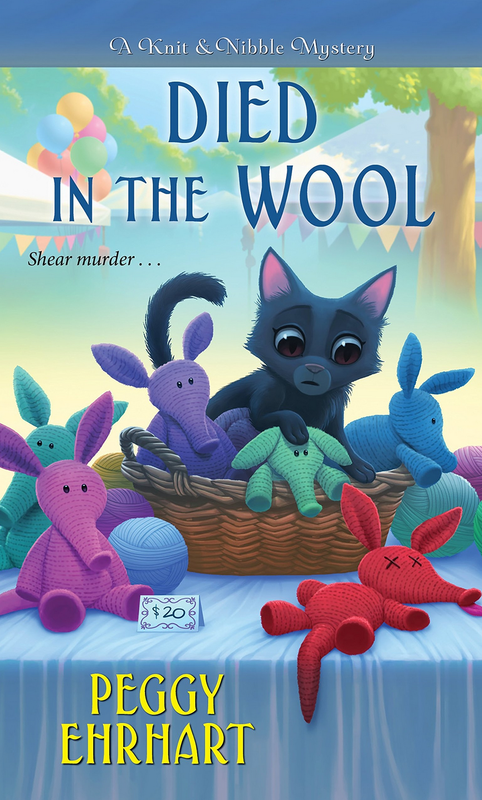 The second book in the Knit & Nibble Mystery series, DIED IN THE WOOL, comes out at the end of August and is now available for pre-order. 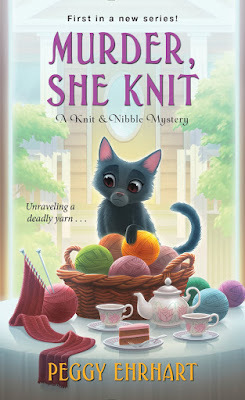 Don't forget to leave a comment with your email address to enter to win a copy of MURDER, SHE KNIT! I love thumbprint cookies! I have been wanting to make some and try lemon curd in them. I have days when that's my idea of a sweet fleet treat . . .thank you. I'd love to win, so I could donate it to my LYS (Local Yarn Store) after I read it. pjcoldren(at)tm.net Thank you! Thanks Peggy for sharing the recipe and a chance to win a book. Life can't get much better when you are reading, nibbling a sweet cookie and sipping tea. Congratualtions on this series I can't wait to start reading. Your book covers look absolutely adorable. I love having a shortcut in my back pocket for days I need to pull a little something together and do not have the time/energy. Thanks for the idea. Those look great! I love the quick and easy shortcut. Your covers are adorable. Are those aardvarks on the second cover? Too cute! Thank you so much for the chance to win! Those cookies look scrumptious. Cookies, knitting, and a cozy mystery sounds perfect to me. I would love to check out your book. First off, let me say that cover is adorable! I love it. I was unaware of this series and am adding it to my TBR pile. And the recipe-how easy and wonderful. Must give it a try. I especially love how you could get a variety of flavors in one batch simply by using a variety of jams! What a cute cover! Sounds like a good cozy, thank you for the chance to win a copy. I love EASY recipes and this one fills the bill---I actually think I could make these cookies! That kitty on the cover of the book makes me want to read it---cozies with critters are my favorite reading material.